I'm wondering if anyone else has had difficulty when using several tracks worth of titles in PD17. I'm doing an extended project and for a couple of scenes I wanted to bring up a list of words to match the narration. I've tried making the title as a separate project and inserting it into my main one, but everything bogged down too much. I also was having difficulty with extreme slowdowns when working with titles when I was running Windows Insider builds, so this is a brand new clean install of Win10 RS5 (2018 Fall Update) and PD17 2314. The problem is that it takes anywhere from 10 to 90 seconds (avg delay = 35 sec!) 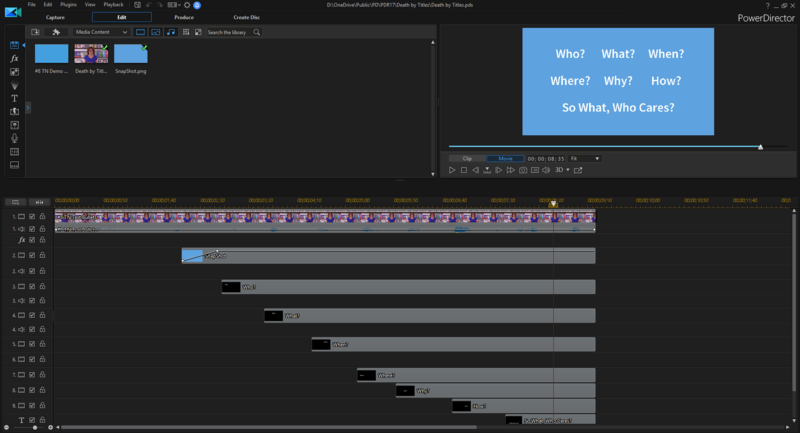 for PD to respond after almost any action: clicking on a new timeline location, clicking on a clip, dragging a clip, editing the text, changing the duration of the effect. That last one is brutal, especially for the title on the lowest (title) track. Most times I tried that edit, PD just locked up and didn't respond for at least 5 minutes before I killed it. This is happening on a brand new i9-9900K system and it took over an hour of teeth ganshing perseverance to even get the project to this level of completeness. The size of the PDS file also seems enormous for such a trivial project, and it may be that parts of my original project are somehow embedded in the file. The PDS file had several references to a huge AVI file from my original project that is not used at all here, and I renamed the clip and told PD to ignore that clip when it couldn't find it, then I saved and packed the project. I'd appreciate any input from other people who'd like to download and test this project, and also whether you think it's something specific to this project or titles effect or if you run into massive delays simply by having 6 or more titles overlapping. Ok There is actually 2 files you can download in that place. I DL the project and its missing 1 images. I loaded it and compiled it. I did not reboot my computer at all. I was playing Division 2 beta for the last 12 hours on the system. I also edit 4 videos today and Working in Paint pro for 3 hours also. With watching youtube videos and checking out facebook. So I had like 18 windows in firefox and 9 more in chrome. I then loaded your project and what you see in the video below is the result this is unlisted video which I will delete soon. Your titles project played back pretty smoothly here. No "death by titles" to speak of. After playing with it a bit and shifting title positions, there were times when there was a little lag, but nothing major. Screen capture shows original project then with titles slightly moved to sync better. Thanks everyone for testing this out. Strange the the packed project didn't correctly set the location for the SnapShot.png image, which is present in the packed project folder. The main issue I have is not in playing back or producing the clip, it's making ANY changes to it, especially after making 2 or 3 initial changes. EDIT: I've just manually removed the path reference for the SnapShot.png clip in the packed PDS file, so anyone downloading it now will have the image load correctly. That's clearly a Pack Project Materials bug, but maybe it's a clue to why my computer is having so much trouble working with this project. Sorry - I mustn't have read your initial post properly. Yes - there's definitely lag happening with that scenario, shown in the screen capture below. The annoying thing is that what has to be processed is not all that complex! As an alternative, I reconstructed the titles so they're all in one track. i.e. all duration/sync editing need to be done in Title Designer. I found that more responsive & less taxing. Here's the packed project. Maybe that approach is worth considering. Quote Hs an alternative, I reconstructed the titles so they're all in one track. i.e. all duration/sync editing need to be done in Title Designer. I found that more responsive & less taxing. Thanks very much for tidying this up! I had moved all the titles onto the top 3 tracks in order to get any editing done, so the depth of titles seems to correspond to death by titles, especially on my brand new platform. I tried editing my original project on a second PC, and it was laggy like you've seen, but not excruciatingly so. If I have time, I may experiment with some settings and see if I can identify any that are the major culprits/triggers. This morning I was elated to see that the long-awaited update for subscription users was released! It has been a while and I don’t remember spending time with the project. There might be any easy fix for this. Turn off hyperthreading in the bios and try it again. 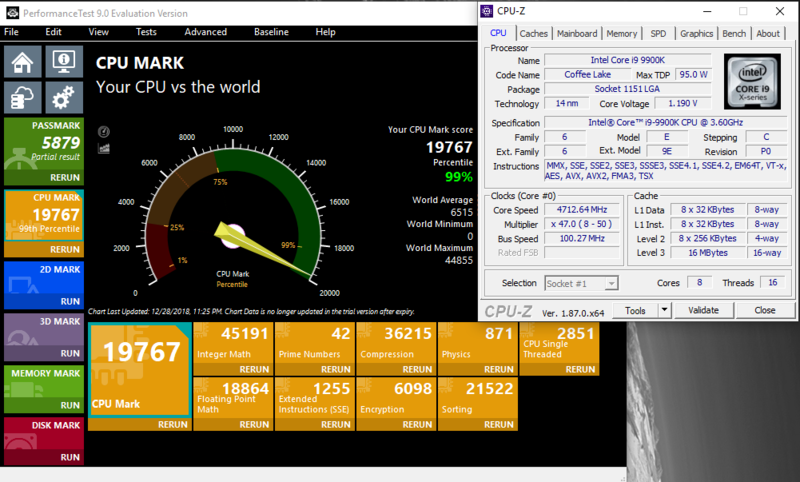 I was reading some articles that hyperthreading can give 5 – 30% greater performance but sometimes hinder performance. This remind me of the Janes FA game that ran well in my P3 500 Mhz W98 gaming pc. It was full of hangs and freezes on my homebuilt P4c 3 Ghz machine. In a forum the suggestion was to turn off hyperthreading. That fixed it. Quote It has been a while and I don’t remember spending time with the project. There might be any easy fix for this. Turn off hyperthreading in the bios and try it again. Tomasc You sir, are a $#^%&% GENIUS! How does turning off hyperthreading affect the rest of the program? Producing? And how does it affect other programs? My website http://bgillcyberstudio.com/index.html LINKS TO PDTOOTS & hundreds of other valuable resources! Quote How does turning off hyperthreading affect the rest of the program? Producing? And how does it affect other programs? Surprisingly, it's only about a 5% hit, and if you use HW encoding to produce, there's no difference at all! Coincidentally, I ran a whole bunch of tests a week or so ago after realizing that some things I posted on another thread about hyper-threading were waaayyy off base. For some reason, I had a completely naive view of what HT was ever since I bought my first serious i7-4770k PC 5 years ago. Now, I (finally) wanted to really understand how it worked and what role specifically HT might play in PD's domain. Like tomasc, I saw some mentions about performance taking a hit under some circumstances, but I didn't ever connect that with the titles in PD. It just seemed like it was something with the titles since I didn't see any consistently terrible performance anywhere else. Now I know! Take a look at the attached Passmark and producing scores with HT enabled and disabled. 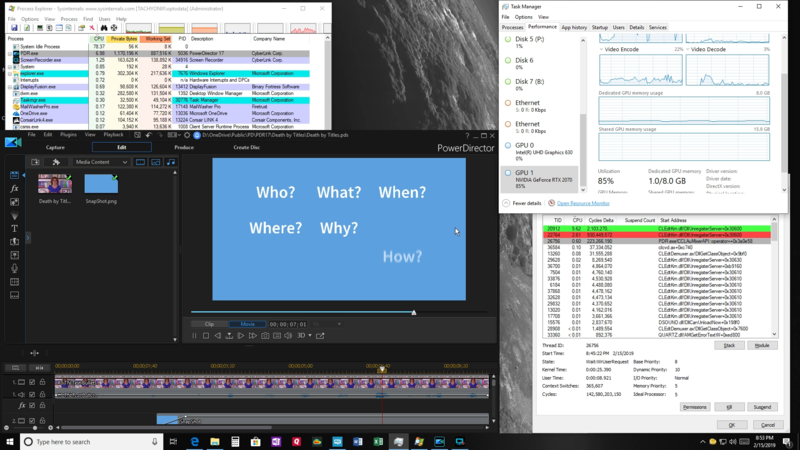 My test was producing a single 20 min HD 60p H.264 MTS clip with no edits. YMMV w/ or wo/ HT, but as long as I can actually use PD17 on those kinds of projects now, I'm happy to turn it off. For now, at least. Quote Surprisingly, it's only about a 5% hit, and if you use HW encoding to produce, there's no difference at all! Kind of funny, I don't think you realized anything, I think you were politely prodded that your 2X improvement you've mentioned in several threads for HT benefit was in fact bogus for PD which probably led you to finally do a few PD tests yourself. HT does affect HW encoding as well, but it's hardware and more specifically timeline content and decode options influenced. But yes, as mentioned previously, HT when beneficial to PD encoding is typically in the 5-10% area on producing and when detrimental, again about 5-10% deficient. I'm not sure I'd call this title issue solved, I'd think a real solution would be for CL to have a look at the code surrounding titles and fix in an upcoming patch, that would be a solution. Many COTS system purchased by default have HT active so PD compliance I'm sure would help end user frustrations. Although details appear to be missing for PD17, prior PD versions would state "optimized for CPUs with MMX/SSE/SSE2/3DNow!/3DNow! Extension/HyperThreading/AVX2 technology" It's obvious something amiss with CL titles coding with WIN scheduling of the threads, could be even a simple oversubscription when a thread simply enters a sleep state. Optodata – Thank you for publishing your tests showing HT comparisons with your Nvidia video card. I will bookmark this valuable info which show that I should have one should I ever decide to go to h.265 encoding. 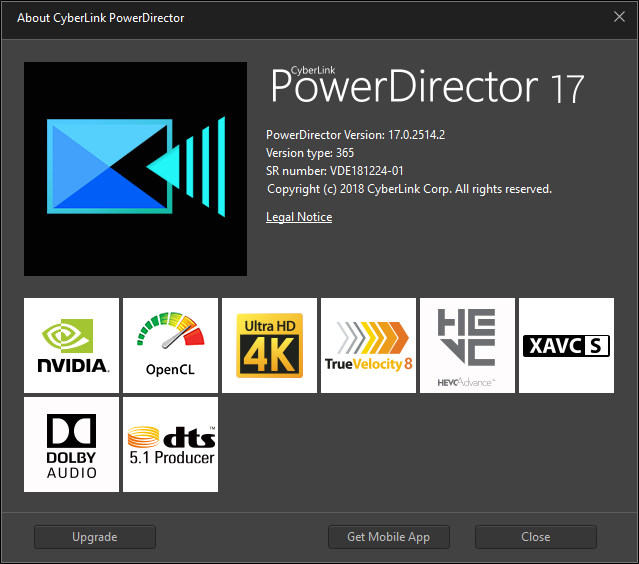 BTW: My TV can display can display 4k 60p hevc perfectly from a memory stick. Hyperthreading from what I remember in Byte magazine is something an engineer came up with when he analyzes how programs should be written to the way the average programmer actually writes the programs. He found a single thread could have a lot of idle time on a core. Starting a second thread on the idle time can speed things up. Using predictive analasis a thread can be discarded and a new one started if the old one did not follow the prediction. In some cases it can be as good as having a second core. It looks like the developed algorithm used works fine now for four cores that many of us uses but maybe not for eight cores for now. Maybe a new stepping on a processor can change things. I don’t know if a programmer can write a program that works equally well on a hyperthreaing four and eight core processor at the same time. That was interesting reading at the time I built my Pentium 4c hyperthreading pc many years ago. With all due credit and appreciation to tomasc for the HT idea, it turns out that's not really the cause. Clearly things were very good when I first tested PD with HT turned off, but I started noticing that the problem was still present. Eventually I determined that having HT on or off was not the biggest factor, rather it was whether Edge was running or not. I did all kinds of testing with debugging and monitoring tools but couldn't determine what's actually going on. However, I can say that whenever I close Edge (regardless of how many/which pages are open), PD and titles behave much better. I will post back if I find anything more out, but at this point if anyone is seeing unexpectedly long lag times (especially when opening projects, having PD unexpectedly "go away" for long stretches while editing, or working with titles), try closing Edge and see if that makes a noticeable difference. I almost always have IE open on my pc without ill effects as well as in testing the death by titles project early on. In my initial testing of edge on win 10 four years ago found a feature that allow malicious websites to open the next time edge is open again. I had to manually remove them. After that I only open IE and chrome and they don’t have the edge stored feature. Maybe using Chrome instead of Edge may help as I don’t notice any slowdown with it open. My video editing pc still runs on win 7. My laptop is on win 10. Maybe writing a support ticket could help as Jeff suggested.